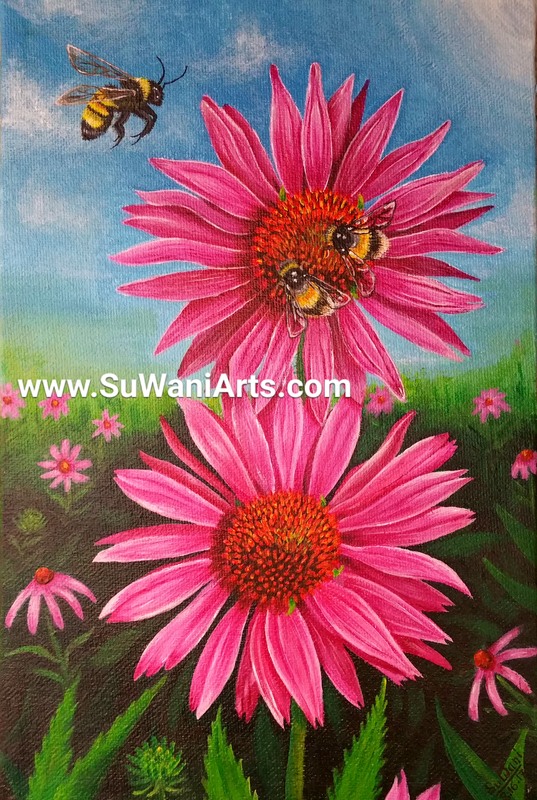 Inspiration for this painting came from a photograph that I took in my mobile camera while visiting Franklin Zoo with my family last summer. 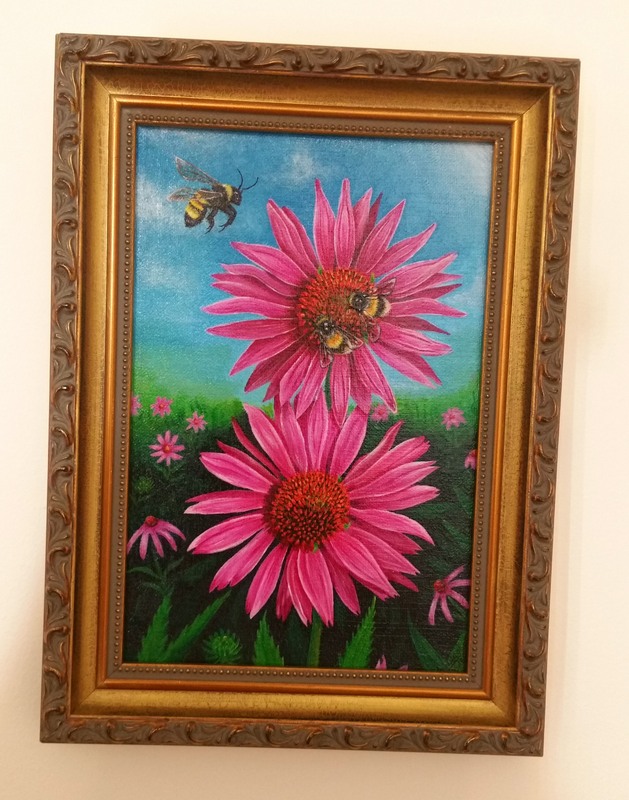 That picture of a corn flowers bush and some flying bumble bees played a beautiful yet strong idea in my imagination. 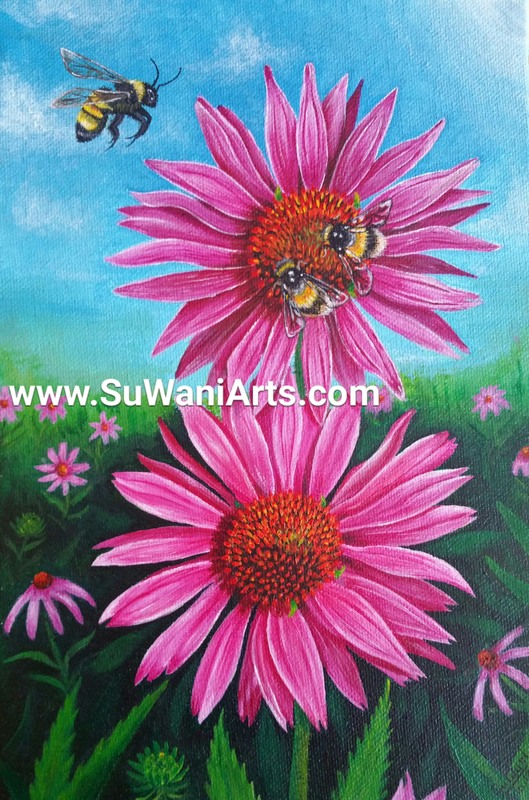 In my painting: while the two corn flowers (as a couple) sharing their motherly love by providing their sweet honey to the two baby bumble bees, the mommy bumblebee is providing them protection. ‘Love’, ‘Food’ and ‘Protection’ are the three most important things that every child needs from the environment to grow up. I stared this painting on my last FNO (Friday night out) visit in our art gallery. In the following week I got very sick with severe sinus infection and fever and for that I have been put on a high dose (3000 mg every day) of antibiotics. As I became physically very weak so I couldn’t think of finishing my this painting so early. I am very blessed to have my friends who showered their love, best wishes and blessings on me so that I can get well soon. While some of my friends took some times from their busy schedule just to see me and make me feel better and helped me with food and flowers, my friends who leave far away (physical distance) from me showered their best wishes and most of them communicated with me through text/phone/video almost daily and everyday they are asking about my health and motivating me to recover soon. I realized how rich I am, how I lucky I am and how blessed and loved I am. So I am dedicating my this painting to all my good friends who really helped me to come out from my illness. I will always pray to the all mighty for your good health, happiness and prosperity.